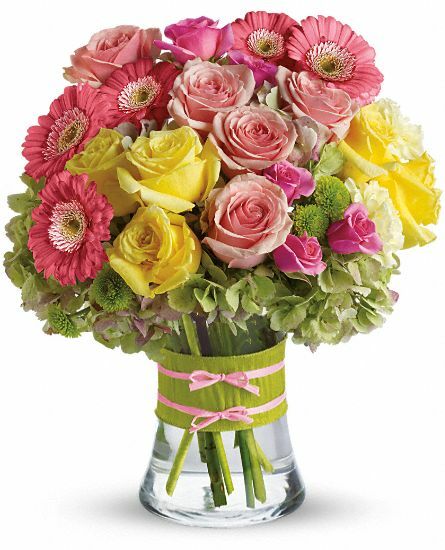 Gorgeous hydrangea, yellow and light pink roses, pink spray roses and mini gerberas, light yellow carnations and green button spray chrysanthemums are delivered in a pretty gathering vase. This pink and yellow bouquet is accessorized with a beautiful ribbon and raffia. 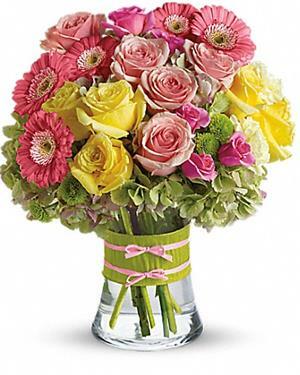 Pastel rose bouquet is approximately 10 W x 11 H. We also carry mixed rose bouquets.